Starting on the same date Jimmy Smith recorded the funky soul jazz of Midnight Special and ending on the day Monk recorded At The Bluehawk, April Jazz 2012 marks the calendar with a big tick. In it’s 26th year now it’s established itself as one of the key festivals in Europe. This year is an absolute storm of musicianship from the cream of jazz at venues in Espoo, Finland. Founded by the late Martti Lappalainen, who was an accomplished musician, conductor and leader in the Espoo Big Band orchestra, the main event space is in the Tapiola Hall at the Espoo Cultural Centre. A smaller hall for more intimate concerts are held at the Louhi Hall. Headlining this year is the charisma and soulful voice of Patti Austin, who’ll be performing on two nights with the Espoo Big Band and her trio. Other luminaries of jazz include the legendary Jan Garbarek Group featuring Trilok Gurtu, the eloquence and sophistication of bassist Avishai Cohen, one of the most talented musicians in Europe, Verneri Pohjola and his Quartet featuring Jukka Perko and one of the most innovative and widely acclaimed saxophonists to date, Rudresh Mahanthappa. 22 artists in all performing over six days in three venues. 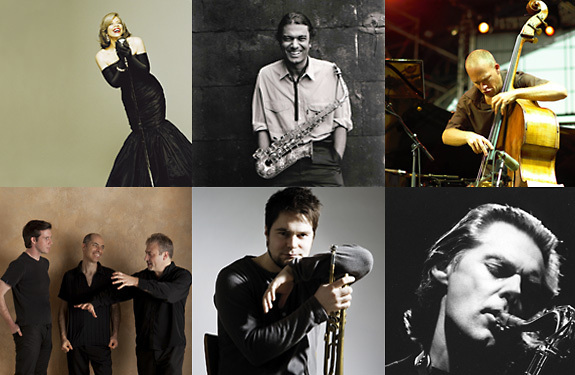 April Jazz 2012 promises to be the first installment to an amazing season of Finnish Jazz. We’re looking forward to reviewing the event in full and hopefully doing some interviews so stay tuned. We can’t wait! INFO: Pricing of tickets range from €10 – €45, depending on the concert. Further info can be found here for tickets. You can also buy tickets to the Jazz Tent half an hour before the concert starts from the door if not sold out. Tickets to all concerts are also sold in Espoo Cultural Centre’s ticket office. The newest venue of April Jazz, Kino Tapiola, brings a breeze of the fifties to April Jazz. This old movie theatre’s facilities were renewed last year, but the the original smooth atmosphere has been retained. The whole theatre, lounge included, will work as a bar where you can find drinks and small snacks while enjoying the show. After the concert you can continue your night in the lounge. Getting to the venue is even easier with the free Jazz Bus. It will offer a free ride for the April Jazz guests from Helsinki to Tapiola and back. The Jazz Bus leaves from Lasipalatsi address Mannerheimintie 22-24. The ride from Tapiola to Helsinki leaves in front of Sokos Hotel Tapiola Garden. For a good choice of hotels with discount prices, visit Hotel Reservation in Espoo for more information.